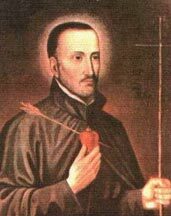 “All the Christians among my countrymen loved the Father and grieved for his death because he was the father of us all, and so he was called by the Indians of the Paraná River.” So testified Chief Guarecupi after the martyrdom of Jesuit Roque González and his companions in Paraguay in 1628. The Indians loved him because they had felt his love for them and their ways. And they knew that for two decades he had sacrificed everything to improve their lives both materially and spiritually. This town had to be built from its very foundations. In order to do away with occasions of sin, I decided to build it in the style of the Spaniards, so that everyone should have his own house, with fixed boundaries and a corresponding yard. This system prevents easy access from one house to another, which used to be the case and which gave occasion for drunken orgies and other evils. A church and parish house are being erected for our needs. Comfortable and enclosed with an adobe wall, the houses are built with cedar girders—cedar is very common wood here. We have worked hard to arrange all this. But with even greater zest and energy—in fact with all our strength—we have worked to build temples to Our Lord, not only those made by hands but spiritual temples as well, namely the souls of these Indians. On Sundays and feast days we preach during mass, explaining the catechism beforehand with equal concern for boys and girls. The adults are instructed in separate groups of about 150 men and the same number of women. Shortly after lunch, we teach them reading and writing for about two hours. There are still many non-Christians in this town. Because of the demands of planting and harvesting all cannot be baptized at the same time. So every month we choose those best prepared. . . . Among the 120 or so adults baptized this year there were several elderly shamans. Roque and other Jesuits built more than thirty reductions with an average population of three thousand. In 1628, Roque and Jesuits Alonso Rodriguez and Juan de Castillo started a reduction on the Iijui River and another at Caaró on Brazil’s southern tip. Somehow they roused the hostility of a shaman who determined to exterminate all Jesuits. On November 15 his men tomahawked Roque and Alonso at Caaró. Two days later at Iijui they stoned Juan to death. In 1934 these three became the first American martyrs to be beatified.